Here is the current setup with stem down to the headset cap. If I was to go lower then it bigger neg stem/flat headset cap is needed. Drop to handlebars is 70cm. Don't think my dodgy shoulder can take more in its current state. I would get toe overlap in any frame around this size.. Not sure if that's avoidable unless you go larger. Sorry I shouldn't have stated the obvious, toe overlap is unavoidable in small sizes, and us shorties just have to live with it. Currently I have a tarmac SL5 size 54 and after a bike fit (the one of specialized) I changed the stem from 100mm to 80mm. 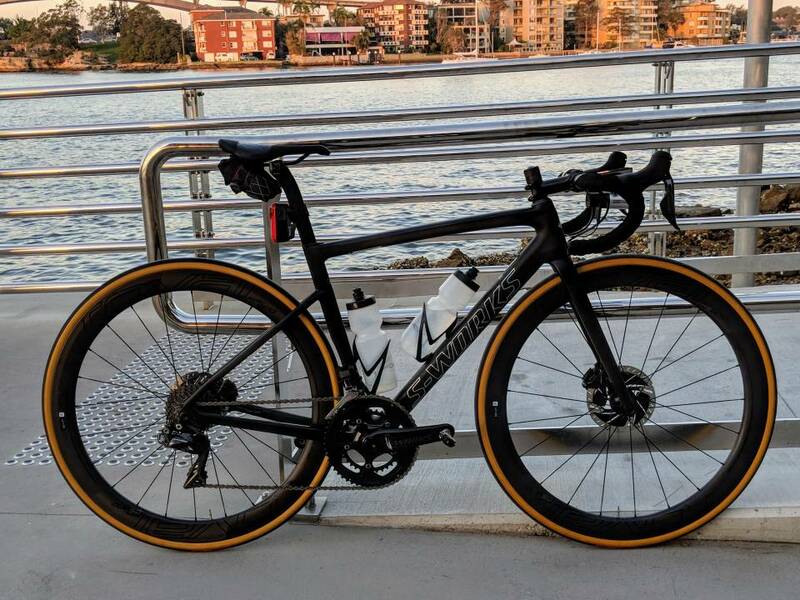 Although I used to ride 54 size specialized bikes with 100mm stems after a surgery on my lower back (from a crash) I started feeling too stretched. If I move to Sl6 (which has slightly different geometry compared to sl5 ) in order to keep a stem of minimum 100mm which size do I have to choose? 54 again or 52?? Without looking at charts/specs and therefore not giving you the answers per se, look at Reach figures. You need the Reach to be 10mm shorter to use a 10mm longer stem. Sychen - are you in Sydney? Looks like a Sydney ferry wharf and Gladesville Bridge in the background. Maybe Chiswick wharf at a guess? Yes I am,, and yes that is Gladesville bridge and yes that is Chiswick wharf! good eye. I have a 52cm, but should have bought a 54 (I'm 5' 10"). Let me know if you're interested in buying my SL6 Disc! I'm 170cm with a saddle height of 690mm. I'm on a SL5 size 52 with 5mm spacer and 110mm stem. I'm The Geeky Cyclist where I write about many things cycling. I have minor toe overlap because my cleats are setup more on the back. nice thread. I have a question in this regard. I don't know which frame fits better to me, 52 or 54. Your measurements are similar to mine just 4 cm taller overall and justb2cm longer at Inseam. Drop and saddle height is very similar too. I ride a 52 with 90mm stem.. I think you can get away with 52 with a longer stem. I was on a 56 SL5, and moved to a 56 SL6 without realizing they had slightly altered the geometry. I guess that explains why I felt a little more skrunched and find myself trying to slide back on the seat all the time. How would I solve this, just add a slightly longer stem? Maybe drop a spacer?